What is the good life? 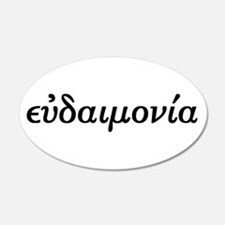 The ancient Greeks referred to it as eudaimonia, which very unfortunately often gets translated into modern English as “happiness,” a vague concept that usually refers to a momentary feeling of pleasure. A closer rendition is “flourishing,” but I think an even better one is: the life that is truly worth living, i.e., the sort of life one may look back to on one’s death bed and think, yup, that was worth whatever pain accompanied it. During the Hellenistic period — roughly from the death of Alexander the Great in 323 BCE to the Battle of Actium in 31 BCE, which marked Octavian Augustus’ ascent to power in Rome and the beginning of Empire — there was an explosion of philosophical schools, each with its own conception of eudaimonia. Let me remind you of the major ones and how they were related to the obvious pre-Hellenistic point of reference: Socrates. During the Hellenistic period the Platonic Academy was dominated by Skeptics (Carneades, for instance, though Cicero professed to be one as well), who didn’t really have much to say about the good life, for simple reason that they did not believe we have knowledge, and that consequently we should suspend judgment on all matters, including, coherently, what constitutes eudaimonia. The best Sextus Empiricus (a Pyrrhonian Skeptic) came up with was to recommend a life of detachment based on epistemic — not moral — reasons, talking little about virtue, and saying nothing about eudaimonia. The Peripatetics, followers of Aristotle, by contrast, had a lot to say on the subject. They thought that the life worth living is the result of a combination of two factors: virtue and certain externals, such as health, wealth, education, and good looks — at least in some measure. This is rather commonsensical, but it also makes the approach somewhat elitist: if you don’t have a given level of externals you are screwed, no eudaimonia for you, buster! Moving to the hedonistic branch, the Cyrenaics believed that the good life is achieved when one seeks physical pleasures in the moment. This still needs to be done virtuously, so that you own the pleasure, not the other way around. The Epicureans, however, valued mental pleasures (e.g., the company of friends) higher than physical ones, and at any rate for them eudaimonia consisted mostly in the absence of pain, both physical and especially mental. Hence their famous (or infamous) advice of withdrawing from social and political life, which is notoriously painful. Finally, we move to the Cynic and Stoic branch. And here is the funny thing: there was no distinction between these two schools in terms of their view on eudaimonia. They both taught that virtue is necessary and sufficient to justify a life worth living. This means that anyone at all can be eudaimon: it doesn’t matter whether you are rich or poor, healthy or sick, educated or ignorant, handsome or ugly. How refreshing. The Stoics, by contrast, acknowledged that people have needs and interests outside of virtue, and thought that this can be part of a eudaimonic life so long as externals are treated as indifferent, i.e., it’s fine if one has them, but it is not good to get attached to them. A fortiori, it is certainly not acceptable to obtain externals by compromising one’s virtue. 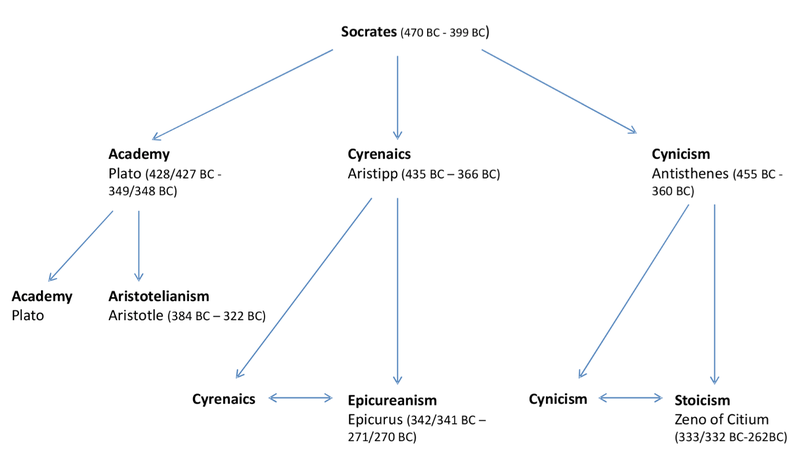 In a sense, then, the relationship between Cynics and Stoics can be understood as being similar to that between Buddhist monks and lay Buddhists, or between Catholic priests and nuns and lay Christians: the stricter version of the philosophy (Cynicism) is only for a few who are answering a call, while the accessible version (Stoicism) is for everyone else. Cynicism is hard work, and only suitable for the few that are capable of rising to the challenge. For the rest of us, a eudaimonic life that is focused on the improvement of our moral character but that allows — and yet, crucially, does not require or depend from — externals, is indeed the kind of life we will be able to look back to near the end and think: yup, that was worth it. This entry was posted in Ancient Stoicism, Virtue Ethics on September 11, 2017 by Massimo. I increasingly wonder whether the Stoic treatment of externals as indifferent doesn’t turn elitist in a different way, and in a way that is contradicted by the consensus of modern social science research. One way of interpreting the notion that only virtue matters, with externals indifferent, is that issues such as income and wealth inequality don’t much matter. Well yes, justice matters, but as long as the disparities of income and wealth are not not unjustly acquired, what’s the problem? And historically, I don’t see the Stoics making a big push against institutions of the ancient world such as slavery. But in fact most of modern social science research points to the reality that disparities of income and wealth make it much more difficult for some to acquire virtue. In some cases there are clear physical mechanisms — for example, exposure of children to lead in drinking water seems to cause some brain damage. In other cases there are psychological/physical mechanisms: students of early childhood development talk about the toxic stress caused by poverty in childhood, and what that does to distort child development. In other words, in practice, the externals have strong CAUSAL effects on the ability of a person to attain the classical virtues of moderation, courage, practical wisdom, and justice. I have not seen any evidence of the ancient Stoics being aware of this as an issue. Am I missing something? There also is the issue beyond childhood that in practice, broadly shared economic growth seems to play important causal roles in allowing a society to be more tolerant of minority groups. (This is the argument of economist Benjamin Friedman, in “The Moral Consequences of Economic Growth”.) One can debate exactly what has caused U.S. society to turn more mean-spirited in recent years, but it is certainly a plausible position that some of this mean-spiritedness stems from economic frustrations given that a large percentage of the U.S. income distribution has not seen robust growth in per capita living standards for 30 years. Again, the Stoics, living in a different society, with much less economic growth, and far greater economic inequality, understandably do not seem to have imagined a society that might see a general rise in per capita living standards for all groups. So the issue of economic growth and how to share it, and what this might do for promoting virtue, simply wasn’t an issue they would have debated. I think in talking about modernizing Stoicism, people sometimes simply talk about incorporating modern natural science. For example, given that evolution has provided an alternative to intelligent design in explaining the biological world, much of the Stoic talk about the universe being planned seems obsolete. But I wonder, given: (1) we have economic possibilities of economic growth that the Stoics did not imagine, and (2) that we have more social science evidence that this matters to human capabilities, would it be desirable to modify Stoic doctrine considerably to reflect these modern realities? Hmm, my gut inititally told me that that’s not quite right, but then I thought maybe that’s because I’m confusing eudaimonia (flourishing) with ataraxia (peace of mind), the latter of which is a professed outcome of Pyrrhonian skepticism. Whether or not Pyrrhonians embraced the term “eudaimonia” (e.g. it might have held negative sectarian connotations for them), I would say that “ataraxia” is at least a functional equivalent here: that is, to flourish in Pyrrhonian terms is to achieve the peace of mind that comes from practicing Pyrrhonian skepticism. You make very good points, but it seems to me one could raise precisely the same objections against Buddhism, or Christianity. And they would not be on the mark for the same reasons: just because all these philosophies teach us that we can retain our dignity and worth as human beings regardless of external circumstances (though for different reasons, especially in Christianity) it doesn’t follow that we shouldn’t engage in social and political activity. Indeed, this is more obvious in Stoicism, given not just the virtue of justice and the discipline of action, but the whole idea of cosmopolitanism and the constant refrain of doing useful things for other people. Also notice that no ancient philosophy or religion questioned the institution of slavery, or the idea of wealth inequality. Those are modern ideas that can be grafted onto the basic root of Stoicism, Buddhism, or Christianity, making the whole tree more robust. I checked, the Skeptics did not really use the word eudaimonia. Your suggestion that ataraxia serves the same function is interesting, but I don’t think it’s quite right. The Stoics too aimed at ataraxia, and so did the Epicureans, but they saw that as an outcome of the good life, not as its definition. But perhaps the Skeptics couldn’t do better than that, given their epistemological stance. Its also fine if one doesn’t have them. Well, I think it needs to be qualified: “fine” in what sense? In terms of one’s moral worth and character, yes. But they are preferred / dispreferred, so it’s not “fine” in the broader, non moral sense. The fact that certain externals make it easier to be virtuous is a fact recognized by the Stoics as well. That’s why they are “preferred.” But to make them a requirement certainly is elitist. I honestly didn’t think that way myself, until I realized that was likely because I’m privileged, with health, education, a bit of wealth (no good looks, alas). Massimo: Agreed, if one is skeptical of Stoic claims of eudaimonia, but has first-hand experience of ataraxia, then it makes sense to set the bar only as high as the latter. Of course, Pyrrhonism as a model of human flourishing is itself subject to skepticism: for example, is suspending one’s judgment really sufficient to achieve peace of mind? and, to the degree that it is (say, during moments when one’s more argumentative side is at rest), how practical is it for an average person to maintain that mental state on a daily basis? And are there not other great achievements in life? In any case, I detect a moral dimension in the Pyrrhonian epistemic model, inasmuch as it argues (along with its Buddhist counterpart) that a life of mental peace is a better life. But at a certain point, in the case of severe mental illness, for example, ill health makes it not just harder but quite impossible to achieve eudaimonia. And poverty can be so crushing–one thinks of the distended bellies of children in places like Biafra– that treating it as a mere dispreferred indifferent trivializes it, no? You are pushing the concept to the braking point. We are talking about a philosophy of life, not a magic wand. Yes, eudaimonia requires a minimal set of mental abilities, because if one’s mind is incapable of moral thoughts than one cannot achieve eudaimonia. But surely no other philosophy does better anyway, Stoicism is the most permissive in this sense. And no, I disagree that Biafra-like situations lead people to be immoral. We know of plenty of stories of moral behavior enacted by people under extreme and harsh conditions. That’s one of the best things about the human spirit. Again, though, those conditions are not preferred, and are to be resisted. Oh, if only one could have been a fly on the wall for domestic affairs and stone-pillow talk of Crates and Hipparchia!